Actor, comedian Jim Carrey is also an artist. He paints, draws and sculpts. He says that he began sketching as a child, but he didn’t start painting until later in life when he was trying to heal a broken heart. He says that painting frees him. Well, making art in general is not really a choice. Even acting—all this stuff is the same thing to me. It’s just different modes of creativity. I’ve always drawn and sketched and done cartoons, and I find myself doing that still—I’m still an eight-year-old in my room. It’s a wonderful feeling to make something out of nothing, and it took me over for a long time; it’s another appendage now, and a huge one. There’s not a day that goes by that I’m not covered in paint or something from doing sculptures. 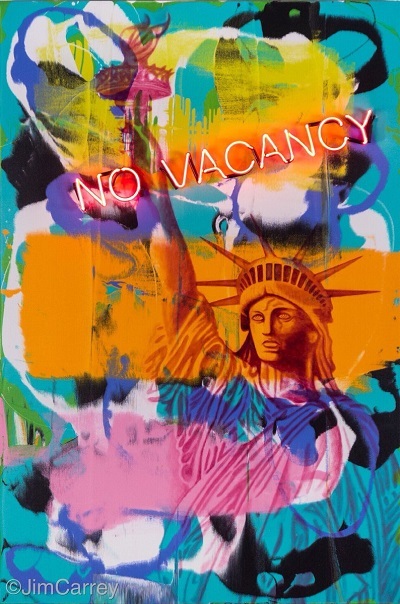 Jim Carrey recently began selling his art and last September he presented an exhibition of his artwork at at the Signature Gallery Group‘s Las Vegas gallery. Lately Carrey has been using his artwork to make political commentary. He posts images of his paintings to Twitter with his comments, often expressing his displeasure with President Donald Trump and those that work for him. This was written by Lorrie. Posted on Wednesday, March 21, 2018, at 8:00 pm. Bookmark the permalink.